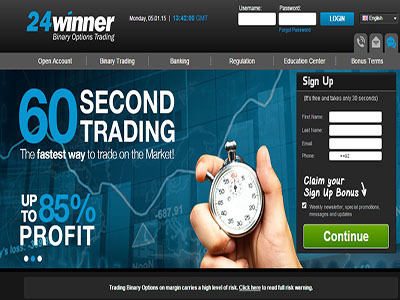 Is 24 Winner A Good Or Bad Binary Options Broker? 24Winner are no longer trading. For a list of alternative brokers, and full comparison reviews, visit our brokers page. Winner Option is one of the latest binary options broker around that is making its mark in the vibrant binary trading industry. Owned by the holding company SafeCap Investment Ltd, 24Winner is actually a new class of binary brokers that are focused on providing interested binary traders with a legitimate and legally regulated environment for trading binaries. The broker is regulated and licensed by the Cyprus Securities Exchange Commission (CYSEC) and the UK’s Financial Conduct Authority (FCA). The platform provided by Winner Option is based on the proven KeyStone binary platform that was developed by SafeCap Investment. One of the key features of the KeyStone platform is the advanced technical analysis charts that the platform has. Apart from its user friendly navigation interface, the platform is fast and efficient and shows very little lag time. The platform also features a wide range of trading contracts portfolio with the expiry time as short as 60 seconds and as long as a year. With the ProOption mode, traders have the choice of Doubling up their investment, early out on their market positions or rolling them over to the next trading cycle. The range of underlying assets available for trading is numbered around different assets covering the equity market, commodity market, the forex market and the indices market. Traders can choose to trade them as classic binaries, one touch binaries, speed master or short term binaries and as touch or n touch binaries. In the ProOption mode, traders also have the ability to pick two different assets of the same class and face them off against each other to see which one will perform better or worse. For normal trading, the payouts at Winner Option can go up to as high as 85%. As for the returns with one touch options, it is possible for traders to earn up to 500% on their investments. Although Winner Option was just recently established, they have all the features that the more established brokers have plus a little more. The most impressive thing about winner option is the advanced charts which they have as this feature is normally only seen on sophisticated forex trading platforms like the MetaTrader 4 platform. Another factor that is in this broker’s favour is the fact that they are regulated in the European Union (EU). While most brokers prefer to park their operations in countries like the Cayman Islands or the British Virgin Islands (BVI), Winner Option have stuck firm to their commitment of providing their traders with a safe and regulated environment for their trading activities by basing their operations in Cyprus and the UK.